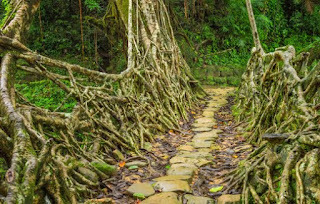 In northern India, the roots of the banyan fig tree are used by the indigenous population to form bridges across ravines and streams. As solutions to problems, these living root bridges are quite successful. It is not known who first built these amazing structures, but the trees are known to live for more than 500 years. With that knowledge, at least as far as bridges are concerned, you don't have to worry too much about the decay of your infrastructure. Led by Dr. Richard Bennett, Bayview's Diversity Council was recognized as one of the nationâs top ten such councils. In this case, bridging the gap involved uniting business interests with community interests with the bridge of commitment toward generating summer employment for minority students pursuing health care and life sciences careers. Bayview was also recognized for its efforts to support leadership initiatives among the medical centerâs under-represented minority and female staff members. Clearly one of his biggest success stories was the iPhone, as it performed the functions of three or four machines with one device. That solves a people problem creating a bridge between multiple needs and utility. But it didn't stop there for Jobs. He went further by creating an environment in which the iPhone was not merely an industry leader. Other companies in that industry were creating applications to use on his iPhone. In essence, he created an ecosystem in which his product sales were now being driven by other companies through their software marketed specifically for the iPhone. Steve Jobs built a bridge between multiple needs of people and the obvious solution to those many needs with a single product. And then, he widened the bridge by getting other companies to basically market his product for him.